DEAR READERS AND FOLLOWERS, MANY THANKS FOR VISITING OUR PLATFORM AND THE OUTSTANDING WORKS EMERGING FROM OUR PHOTOGRAPHERS VISIONS AND DEDICATION TO THE EAST-END. I AM DELIGHTED TO WITNESS THAT THIS INITIATIVE HAS BECOME VALUABLE TO MANY OF YOU. WE HAVE NOW PASSED THE LANDMARK OF 10 000 VISITORS. I AM LOOKING FORWARD TO COORDINATE MORE EXHIBITIONS AND PROJECTS FOR A GROWING AND FOCUSED GROUP ENGAGING WITH THE THEME USING PERSONAL INITIATIVES. HUGE THANKS TO ALL OF YOU! Very special show happening right now in Poplar. 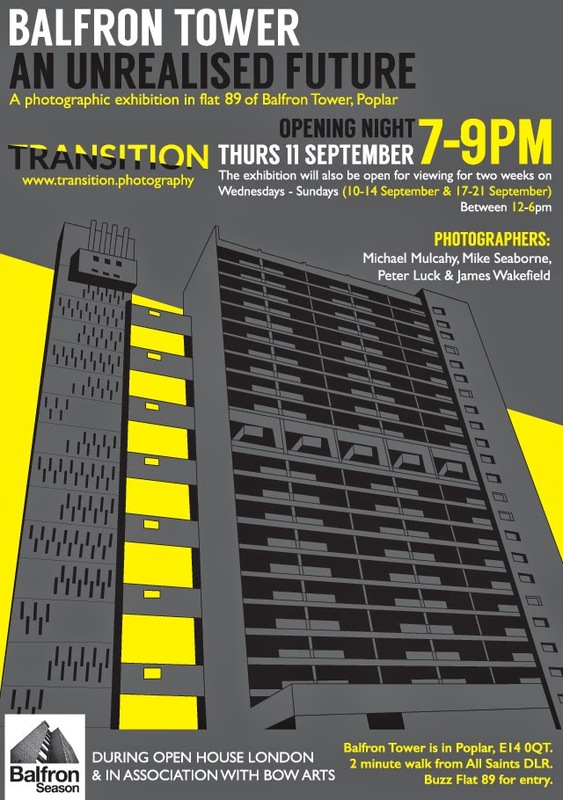 A new photographic group under the name of Transition has invested a flat in the Balfron Tower overlooking Canary Wharf and the A12. Four different takes on the brutalist architecture in a ghostly environment. Mike Seaborne's work is the highlight for me. Simple, straight to the point and poetic with some original twists. I urge you to see the show as the dates are very limited. You will find all the info on the flyer. is a British photographer interested in the relationship between walking and photography. He began his career as a fine art landscape painter but soon became increasingly interested in the portability of photography. He went on to study a BA in Fine Art and Documentary Photography and an MA in Photography from Brighton University. He is presenting his series All Things Pass. Paul is the founding member of the photographic collective MAP6. is a Swedish photographer who resided in East London whist studying photography. Her works essentially attempts to capture a mood from new surroundings. Her Considering Corners series reveal a bare and marginal East End whilst being promoted as something else by the media and hype. is a German photographer who lived for a 14 years in the East End. His work is today mainly commercial but he produced personal projects whilst living in London. 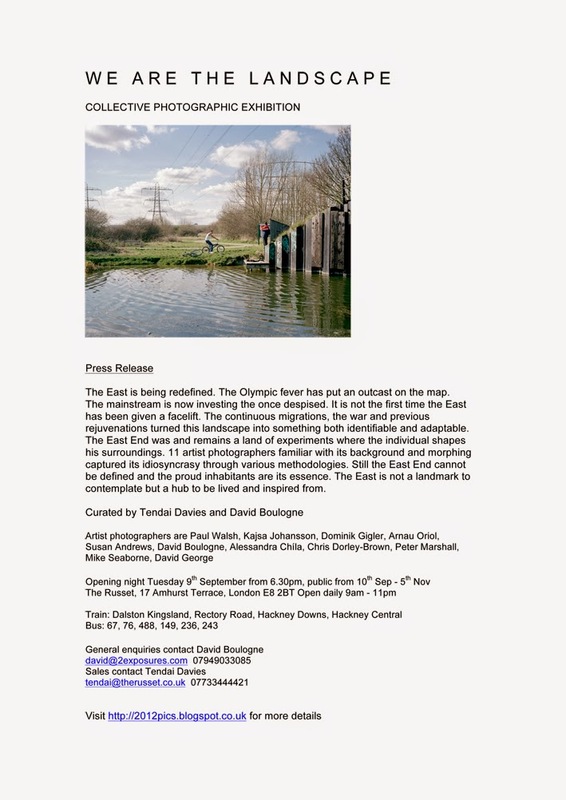 He published his series in a book titled Along the River Lea and tells us the story of a landscape from source to mouth of the stream, a story of non-places. is a Spanish photographer who has been commissioned by the Hackney Council to photograph the borough’s transformation at the approach of the 2012 Olympic games. He has also been commissioned to make a visual mapping of Kingsland road. His personal works are mostly urban and tell stories of isolated individuals. He is presenting prints from his Pre-Olympic Landscapes series. is a British Reader in Photography and MA Photography course leader at The Cass Faculty of Art. She is a practicing photographer whose research interests include the family, home, perception and memory, focusing on the boundaries between public and private worlds. She is a writer, curator and the research project director of The East End Archive at The Cass http://www.eastendarchive.org She is presenting prints from her series Up and down Whitechapel High Street - Photographs from the Car. is a French photographer who is interested in using social photography to invest the relevance of the photographic medium. His Arteries of a new East series show the transformation of the East End by attempting to understand the transient relationship between the old and the new. Boulogne also writes, teaches and curates the 2012pics platform. is an Italian photographer who is interested in the relation that inhabitants have with their surroundings. Her Olympian Visions series translate a tension at the approach of the Games. She is also interested in digging the history and the concerns that make a place identifiable with photography and text. is a British photographer with a strong analytic practice. His works are often East End nightscapes and text based. He has an MA in Photography from the Cass school. He also runs the innovative independent photography review Uncertain States http://www.uncertainstates.com He will be showing the Shadows of Doubt and the Dissolutions series. is a British photographer who has been collecting memories from the East End in the last thirty years. He uses this backdrop to experiment his narratives using different technologies. He likes to explore and blur the lines between traditional social documentaries and the myths it inspires. He will present a mix of his early social documentary years of Hackney. is a British photographer who dedicates his life collecting London memories. He has been photographing the East End long before anyone and keeps returning to it. His endless street photography attempts to deliver a different perspective on the London. You can follow his work in progress. Long time not seen London derives from mid-70’s to mid-80’s will be available to the public. is a British photographer dedicated to landscape and documentary work. Former picture editor of the Museum of London he left to concentrate on his photographic practice. His work depicts urban views in their glory and autonomy. He introduces us to the East End in the most engaging way. Unseen images from his London Facades series will be displayed. The preparations are all coming together , it's all very exciting. I have to collect postcards and flyers tomorrow and will be spreading them as much as possible in the local key stores and general East End galleries. Meanwhile please find attached the press release/invitation for the imminent Russet show next week. All the infos are to be found on that document. We will not be displaying those at the venue in order to save money, waste and hopefully be greener. Only postcards will be at the visitor's disposal in the hope that they will trigger interest towards this blog and consequently re-route the viewer towards each artist's website. To be continued..